Keys may be obtained from the office, Unit 200, located near the flag pole from 3:30 PM - 6:00 PM. After 6:00 PM, keys may be obtained from a lockbox. Please request the lockbox instructions via phone or email. Early check-in may be available for a charge of $100. You must give us at least 24 hours notice, and we are likely to not be able to accommodate any check-in prior to noon. Check-Out Time is 10:30 A.M. – Because these are homes and not hotel rooms extra time is required to prepare the unit for the next guest. Late checkout is $50 for less than one hour and $100 if more than 1 hour and less than 2 hours late. Checking out later than 2 hours past check out will result in a charge for an extra night stay, however, you will not be allowed to stay for an extra night. Keys: Please return the keys to the office at check out. There is a $5 fee for each missing key. Please drop the keys off in the box outside the office, if it’s before 8 a.m. MT. The address to Fall River Village is 200 Filbey Court, Estes Park, CO 80517. From the center of town, go west on Elkhorn Ave. Or, as you enter town, from Highway 34, you can turn south onto Far View Drive or James St, then turn east onto Elkhorn Ave. Shortly thereafter you will see Fall River Village on your left. The office is located in unit 200, right next to the flag pole. Your reservation is not secured until you have signed this document and your 35% deposit has been paid. If you owe a balance on the reservation, it will be automatically charged 30 days prior to your arrival date. Please call us at least 24 hours in advance if you want the charge to be made in a specific way or on a different card. To cancel a confirmed reservation, please call us as soon as you know. Written notification of cancellation signed by the Guest is also required, which can be sent via mail, fax, or e-mail and must be received before the cancelation is confirmed. If you cancel a reservation 30 days or less prior to your arrival date – there will be no refund. The booking can be rescheduled for any time during the 12 months following the original arrival date, subject to availability and current unit rate, and less an $89 Booking Fee. Our apologies, but all reservations are subject to cancelation or substitution by the on-site employee due to uncontrollable circumstances. 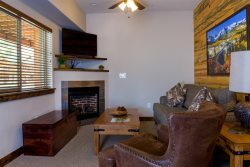 Few mountain properties in Estes Park have air conditioning because the nights are cool and there is a very brief season when the days get warm enough to need one. Even though some of the thermostats at Fall River Village have a setting for A/C, there is no A/C. Boxed fans are available upon request. Fall River Village has very limited parking and therefore for the fairness and convenience of our guests, the parking policy is strictly enforced. ONLY ONE PARKING SPACE IS PROVIDED FOR EACH UNIT AND THERE IS NO VISITOR PARKING ON SITE. Please plan accordingly. You will be issued one parking pass per unit upon arrival. Please ensure the parking pass is in plain sight inside your vehicle at all times when on the Property. VEHICLES WITHOUT A PARKING PASS MAY BE TOWED AT VEHICLE OWNERS EXPENSE. Parking in a second space will leave another guest without a place to park. ANY UNAUTHORIZED PETS FOUND IN ANY UNIT WILL RESULT IN AN ASSESSED FEE OF $300. SMOKING OF ANY KIND INSIDE THE PREMISES OR WITHIN 100 ft OF A BUILDING WILL RESULT IN AN ASSESSED FEE OF UP TO $1000.